Kilometre wise the next leg of our trip isn't far. Just over 130 km. According to Google and the GPS it should take about 3 hours though. Probably due to the depressingly slow speed limits and maybe some windy mountain roads. 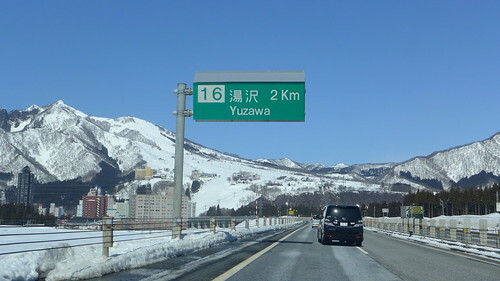 The route takes us north and loops around anti-clockwise via the ski towns of Yuzawa and Nozawa Onsen. 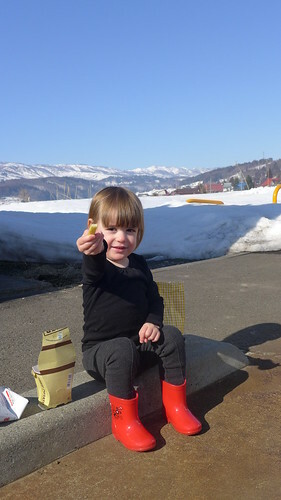 We stayed and skied in Nozawa the last time we were in Japan in 2010. I was hoping to catch a glimpse on the way through. However we didn't have time to make a detour and check it out. 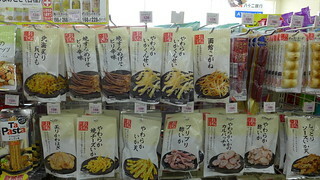 As always we were late leaving and hoped to get to Shibu Onsen before dark - and dinner. A good half the drive is on big highways that cut through and around some pretty spectacular mountains. There's a couple of big ski resorts on the way. Yuzawa has a number of multi story hotels either side of the highway for example. 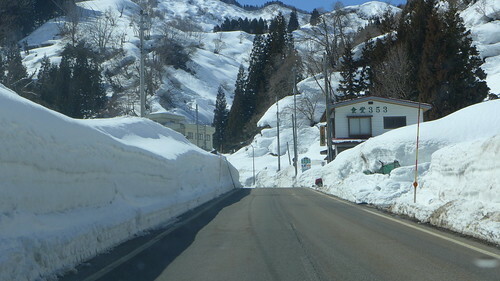 They certainly get a lot of snow in this part of Japan. Average sized house almost disappear into drifts and the some parts of the road go through canyons of cleared snow that could be 10 metres deep. Georgia and Michelle slept through most of the interesting part. Well, interesting if you find monstrous snow drifts everywhere fascinating. 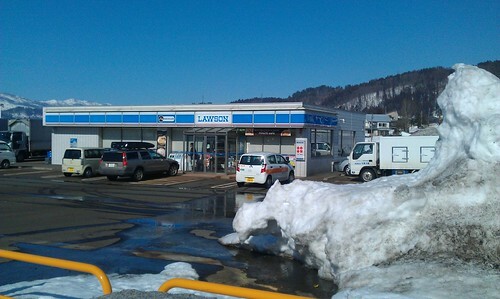 We stopped for a break near the turn-off to Nozawa, at a Lawson Station in a field of snow. Snow is not the only thing I find endlessly fascinating. 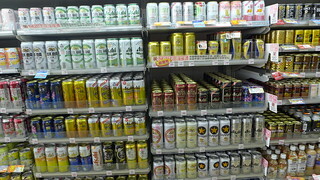 I love the variety of products they stock at Lawson. Georgia just wanted chips and wanted nothing more than to sit down in the carpark and share her chips with me. 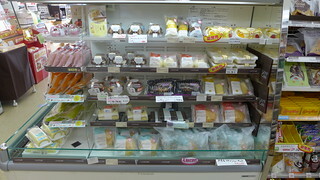 Note the bag of goodies from Osenkaku behind her.